The intersections of gender and caste are sometimes obvious and visible but frequently complex, invisible and indirect. Specific constructions of both caste and gender are deeply embedded in the Indian psyche and their resonance and can be seen in unexpected ways and places. Both arelegitimized by sacred texts and sages as a loose and diffusive of convenience, concretized with time into rigid and irrevocable categories as did the roles and second class status of women. In rich variety of essays, this book explores, analyses, and deconstructs core issues and questions pertaining to caste and gender discrimination—whether portrayed in literature, or in economic, social or cultural context—a common concerns are those who have a stake in building egalitariansocial structures. Mapping Caste and Gender offers a comprehensive insight into the variant forms and nuances of dilemma inherent in the world’s largest democracy in India and elsewhere. By addressing issues of seminal concern from multiple genres, this valuable collection of essays is bound to engage the attention of academics, scholars and activists committed to making the world better we inhabit. This thoughtfully compiled essays draw on texts as well as empirical evidence from one of the heartlands of the contemporary caste movement to extend the understanding of gender, caste class and crosscurrents that emerge in the confluence of the three. This book is an exemplary working life and witness to the history of our times. All societies are based on imagined hierarchy which is detrimental to human civilizations across the world. What is alarming about it is that more than half of the population of the world has beenperipherized, subjugated, and oppressedfor millennia that has crippled the advancement ofhumanity in general and marginalized sections of societies in particular. Even in the twenty first century, human world is reeling under the specter of caste and gender discrimination that has become a matter of grave concern for those who envisage just, harmonious and better world for the whole human race on this planet. 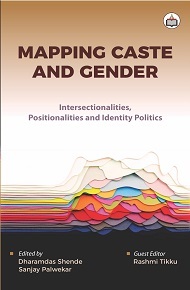 The festschrift Mapping Caste and Gender is divided into five sections according to the genres research papers deal with. It exclusively deals with gender and caste based issues and identities. The contributors of research papers have argued that both caste and gender are not singular epistemological entities, rather,they are compounded by intersectionality of ethnicity, religion, region and class. They have explored the seemingly inexplicable paradoxes of human beings through the characters in imaginative writings as well as discursive legal texts and subtexts. Sixteen research paperstogether from Indian and abroad provide broader spectrum of interrelated issues on caste and gender. We hope, this anthology comprising select research papers would inform all those engaged in academia and socio-political activism to further egalitarian and humane values for enhancement of life of theentire humanspecies. Dharamdas Shende is Professor of English at the RTM Nagpur University. He is a former Fulbright Scholar at Northern Illinois University, USA. He has edited a Festschrift on Deconstruction: New Consideration in Humanities. His research is grounded in Modern American Fiction particularly the examination of cultural issues in American Literature with a comparative focus through religion and philosophy. Other research interest includes Deconstruction, Postcolonial studies and Dalit Sahitya. Sanjay Palwekar is Associate Professor and teaches English at the Department of English of RTMNagur University. He is the author of Literature and Environment. He has edited a book entitled Multiculturalism: Dynamics and Challenges. He has presented research papers in the international conferences in India, UK, USA and Romania. Numerous research papers published in national and international journals are to his credit. His area of research includes Critical Theories, Diasporic and Postcolonial Writings and Eco-criticism. Rashmi Tikku teaches English and is currently Coordinator of the Women Studies Centre at L.A.D. College for Women. She has published numerous articles in reputed national and international Journals. Her area of interest includes Gender Studies, Literary Theory and Indian Writing in English.